In the experiment P3.1.2.1, the coulomb force between two charged spheres is measured using the torsion balance. 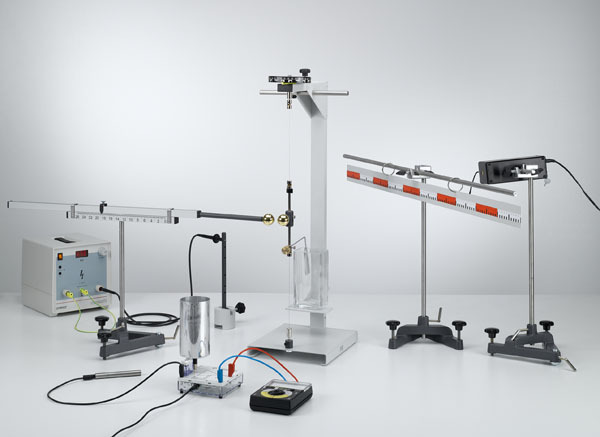 The heart of this extremely sensitive measuring instrument is a rotating body elastically mounted between two torsion wires, to which one of the two spheres is attached. When the second sphere is brought into close proximity with the first, the force acting between the two charged spheres produces torsion of the wires; this can be indicated and measured using a light pointer. The balance must be calibrated if the force is to be measured in absolute terms. and to calculate the permittivity ε0. 1 30042 8 Stand rod, 47 cm, 12 mm diam.